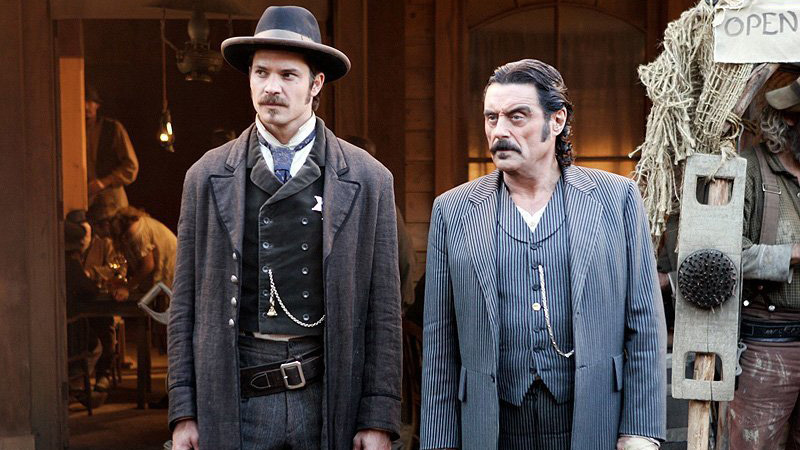 Deadline reports that the long-awaited Deadwood movie, which began filming in November, will be premiering on HBO this spring, just in time to qualify for the 2019 Primetime Emmy Awards. In the film, the indelible characters of the series are reunited after ten years to celebrate South Dakota’s statehood. Former rivalries are reignited, alliances are tested and old wounds are reopened, as all are left to navigate the inevitable changes that modernity and time have wrought. In addition to McShane and Olyphant, returning cast members for the Deadwood movie include: Molly Parker (Alma Ellsworth), Paula Malcomson (Trixie), John Hawkes (Sol Star), Anna Gunn (Martha Bullock), Dayton Callie (Charlie Utter), Brad Dourif (Doc Cochran), Robin Weigert (“Calamity” Jane Canary), William Sanderson (E.B. Farnum), Kim Dickens (Joanie Stubbs) and Gerald McRaney (George Hearst). The film will also feature new cast member Jade Pettyjohn (Caroline). During its three-season, 36-episode run on HBO from 2004 to 2006, the series was nominated for 28 Primetime Emmy Awards, winning eight, including Outstanding Directing for a Drama Series (Walter Hill), and also received a Golden Globe Award for Best Performer by an Actor in a Television Series — Drama (Ian McShane). The Deadwood film was written by David Milch, who also serves as executive producer alongside Carolyn Strauss, Daniel Minahan, Gregg Fienberg, Scott Stephens, and stars Ian McShane and Timothy Olyphant. True Detective creator Nic Pizzolatto also had a hand in writing the screenplay alongside Milch. Buy the complete Deadwood series! Looking for movie tickets?Enter your location to see which movie theaters are playing near you.